People often wonder why our Dante and Allegra don't have many toys. The only thing they seem to have at the house to play with are old buffalo bones (after they have gnawed off the meat and have sucked out the marrow), each other, and the kitty. There are two reasons for this. One, they are simply not interested in many toys. I throw a tennis ball and Allegra just looks at it (throw a bone, and she'll go get it). Get out a kong, and Dante will work hard to get the treat in less than two minutes and then doesn't bother with the kong until there is another treat inside. The other reason they don't get toys is that they destroy them. Once we bought a stuffed squeaky toy and within 30 minutes Allegra had the stuffing strewn across the yard. It was a violent decapitation of a squirrel as I've ever seen, only instead of red blood and guts, it was white fluff. Today I was feeling generous and bought a new toy for the dogs when I was at the store. I am trying to get them interested in fetching without worrying about the dents the buffalo bones will make in the walls and furniture. This toy seemed perfect. It was rubber, and I thought durable. It was soft and wouldn't leave dents when thrown. I got home, showed it to the dogs, and threw it. They were interested and went after it. They brought it back to me to throw again. They chased each other and were having a good time. They left me alone so I could have lunch in peace. Fifteen minutes later, Allegra had snatched it from Dante and laid the toy at my feet. I picked it up and realized that it was soaked in dog slobber. Yew! 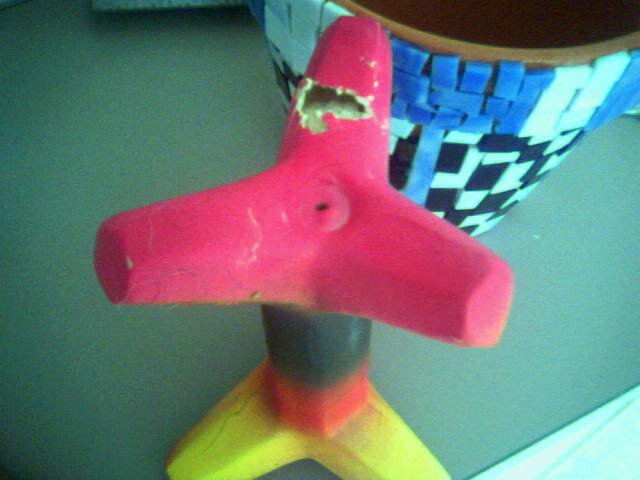 Then I saw it -- they had chewed one of the spindles partially through. Inside was foam. Not wanting to give them a chance to digest the foam, I picked up the toy and set it on the counter. Within 15 minutes, the fun new toy was no more. Guess this means we have to stick with the bones. My parents give their spent toilet paper rolls (the cardboard tube) to their dog. He apparently loves these--but he rips the things to shreds, making a mess!